• Remove any disc from the player, a reset will not work if there is a disc in the Blu-ray player, wait for 'No Disc' to appear on the front display. • Be sure the player is on the Home Menu, the reset will not work if you are any other screen (Menu, Smart Hub, Settings). • 'Not Available' will display if a disc is left in the Blu-ray player. • If your player has a touch panel, be sure there is no disc in the player, and the Home screen is displayed, before pressing and holding the Stop button. 1 Power on your Blu-ray player if it's not already on and and tune your TV to the input where it is connected. 2 With no disc in the Blu-ray player press and hold the 'Stop' button on the front panel for about 8 seconds or until the front display reads ‘SETUP’. 'Resetting all settings to default values...' is displayed on your TV screen as the Blu-ray player powers off and resets. If you press and hold the stop button on your Blu-ray player remote, this will not work. 3 The Blu-ray player powers on automatically and displays the initial setup screen, highlight your language and then press enter. 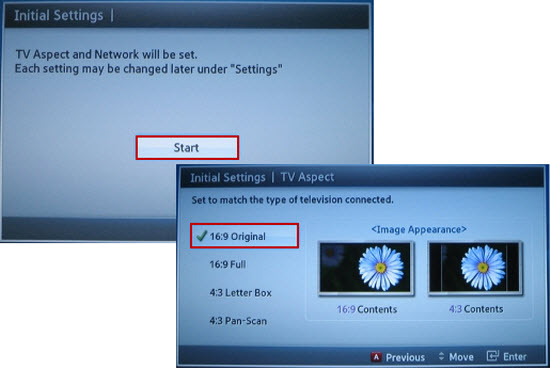 4 TV Aspect and Network prompt is displayed, start is already highlighted, press enter. 5 The Initial Settings/TV Aspect screen will appear. 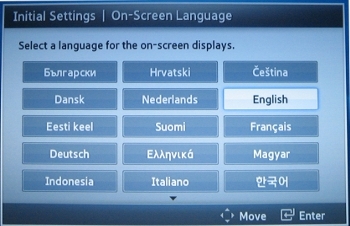 Select the settings appropriate to your TV and preference and thne press Enter. 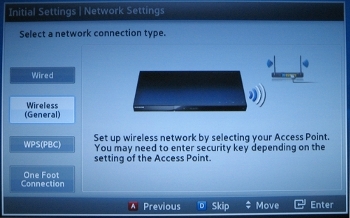 6 The Network Settings screen appears. Follow the prompts to setup your network or press the blue letter D button on your BD remote to skip. 7 The home menu is displayed, all settings have been restored to factory default.